Severe shaking awoke residents in Mozambique at 12:19 a.m. local time on Thursday, as a magnitude-7.4 earthquake struck the seismically active region of East Africa, according to the U.S. Geological Survey (USGS). The East African Rift Zone experienced a damaging magnitude-7.4 earthquake Thursday in Mozambique, centered about 215 kilometers southwest of Beira. Image courtesy of USGS. The event was centered about 215 kilometers southwest of the city of Beira. Stemming from a shallow depth of 11 kilometers, however, the earthquake could be felt by people throughout Mozambique as well as in parts of the neighboring countries of Swaziland, Zambia, Zimbabwe and South Africa, according to USGS. At least five aftershocks immediately followed the main event, according the Associated Press, and seismologists expect more small tremors over the next week. Shaking was strong enough to kill four people and injure at least 29 more, according to a Feb. 24 Agence France-Presse story. 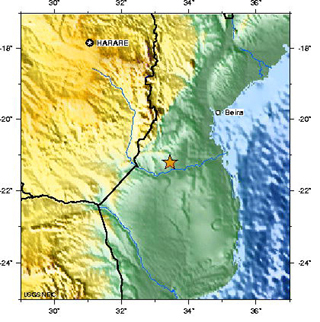 Also, USGS initial reports noted that buildings in Beira and Chimoyo sustained damage, and power outages darkened Mozambique's capital city Maputo, 535 kilometers south of the earthquake's epicenter. Thursday's earthquake was not an entirely uncommon event within the East African Rift Zone, which runs north-south about 3,000 kilometers, from Ethiopia to Zambezi. The event Thursday stemmed from the southern end of the zone, which is being stretched by forces that could one day lead to East Africa splitting from the main continent (see Geotimes, Dec. 5, 2005). On Dec. 5, the zone produced a destructive shallow earthquake centered north of Mozambique in Tanzania  a magnitude-6.8 event that killed at least three people. Andrzej Kijko, the head of the seismology department at the Council for Geoscience in Pretoria, South Africa, says that seismologists expect events in the magnitude-7 range to occur about every 50 years in this area. In fact, an earthquake similar in size and location to Thursday's event occurred in 1940. The extreme distances  up to 1,000 kilometers from the earthquake's center  to which people reported feeling the shaking are a function of Africa's unique rocks, Kijko says. The mostly homogenous rock above the junction of the South Africa plate and Somali plate offers few obstacles for traveling seismic waves. Kijko and colleagues are studying structures that are crucial to understanding East Africa's earthquakes. They know events are more likely at the borders between plates, but he says that it's "more difficult to predict size and nearly impossible to predict timing."